First there was Tom Henke, then there was Duane Ward. 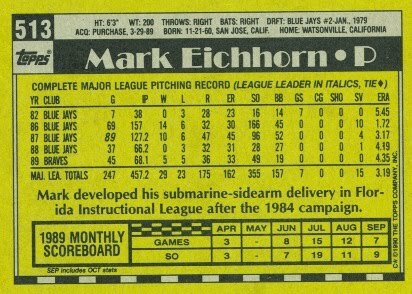 To complete the trifecta of mini bios of 1980’s Blue Jays relievers, we need to examine Mark Eichhorn. Mark Eichhorn originally made his major league debut for the Toronto Blue Jays in 1982 but a severe shoulder injury forced him back to the minors. Having lost most of the velocity on his fastball, Eichhorn reconstructed his delivery in the Florida Instructional League. 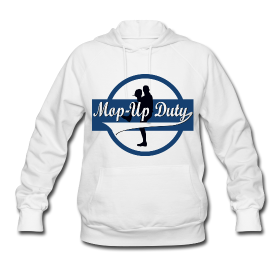 He dropped his arm angle to a sidearm and sometimes submarine level, where his release point was below his belt. In 1986 Eichhorn would return to the Blue Jays after 4 more seasons in the minors. This is when my 6 year old self really took notice. I was fascinated with the grace of his unusual delivery and how right handed hitters flailed helplessly at his offerings. His rookie season was spectacular, posting an ERA+ of 249 with 14 wins in relief, a franchise record for rookie wins. He pitched 157 innings that year, which would be impressive numbers for a rookie starter by today’s standards, but as I said before they were all in relief. Despite having one of the slowest fastballs in the majors, his precision control, deceptive delivery and movement on his fastball allowed him to strike out 166. His WHIP was also a sparking 0.95. 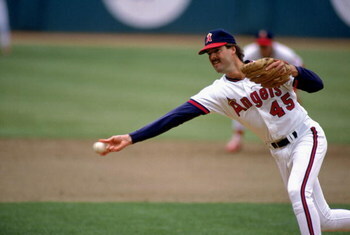 Following his tenure in Toronto, Eichhorn went on to play for the Braves and the Angels, before coming back home to Toronto to win a World Series in 1992. He holds the franchise record for most games in a single-season with 89. Little known fact: Mark was the wingman for Kelly Gruber when Kelly met his first wife, a Toronto Argonauts cheerleader. Today Mark and Kelly remain close friends. Awesome piece about a True Jay! Looks like another case of arm abuse after the 280+ combined IP in 87+88. I imagine this is due to 2 strikes on the hitter but I’d bunt against Eichhorn if he regularly fell off the mound like he does in the video. While I didn’t state it in the original post, Eichhorn was notoriously terrible at holding runners. In an effort to remedy this, the Jays coaching staff attempted to change his mechanics to prevent base stealers from running at will. This had a detrimental effect on his performance until he went to the Angels who let him just do what he does. He responded by posting a 1.98 ERA with an 0.93 WHIP in 81 innings in his 2nd year with the team. I can’t recall exactly how I stumbled upon this blog–I think I was looking for info on Charley Jones–but like what I’ve found regardless. I always thought the Jays had the best late inning tandem in baseball history with Henke and Ward. Eichhorn was another fireman with good numbers. I’ll keep venturing back here from time to time. I created a blog last year: brettkiser.wordpress.com where I write profiles on neglected, yet Hall of Fame eligible ballplayers. It might interest you. I have Henke listed as the best relief pitcher not in the HOF: he really was better than Gossage and Sutter.